Trophies2Go Recognizes Clean-World Maintenance, Inc. This entry was posted on April 4, 2013 by Jessica Anderson. The Almost Dead Last Team is awarded the Golden Throne! Our customer, Clean-World Maintenance, Inc. has been ordering golf tournament awards from us for 10 years! Owner, Derek Grieson, says his grandfather taught him, 'If it's not broke, don't fix it.' So Derek continues to order his awards from us because he says he likes our service. Every June, Clean-World Maintenance hosts the CWM Classic golf tournament for its customers, suppliers, employees and sub-contractors. They award gold and silver resin trophies for 1st and 2nd place teams, longest drives and closest to the pin awards like many tournaments do. But they have a great sense of humor. 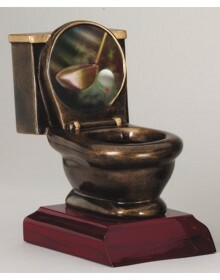 They also award the Dead Last Toilet Resin trophy to the last place team and the Golden Throne Golfing Resin to the Almost Dead Last team. 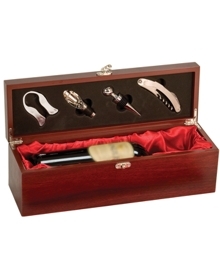 To add a little class to the outing, they award a Rosewood Wine Bottle Display Box with their logo engraved on it to special winners during the tournament. The Wine Bottle Box with a logo on it makes a great gift. You can check out their website at http://www.cwminc.com/. Or you can reach Derek Grieson at 360-256-9250 or [email protected]. You can also request an estimate on their website or by calling 800-643-5850. We’re happy to spread the word about a great customer. You can bet that if they appreciate great customer service, they know how to give it too.